Christmas has arrived in the buttonsforbrains household! Well, in so much as the box with my Christmas stash has been hauled out from the back of the cupboard. So what brought on this sudden flurry (see what I did there) of activity? The answer - this latest cool (see what I did there, again) set of images by Sally-Ann over at the DigiStamp Boutique. Her name is Milly and she is one of three new images for Christmas. I have one of the other Millys ready but I'm saving that one for tomorrows post. Sketch and Stash - a fab sketch. My new item is, of course, my Milly image from the DigiStamp Boutique. One Stop Craft challenge - Let it Snow. This is very snowy but I don't think the camera has picked up all the twinkles. Milly was coloured with Copics and I have used white flower soft on her hat. The sentiment is a Sizzix die cut. Gingham ribbon is a bit of a thing with me just now, not too sure if it suits Christmas, but it's on now and it's stayin'! This is such a cute card! 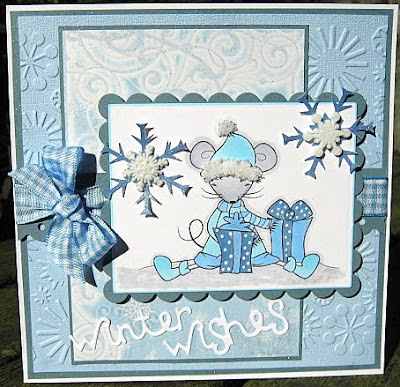 I love all the frosty colours and the cute little mouse! Congratulations on the DT postion! It's very well deserved! Oh this is adorable, what a sweet image and beautiful colours and embossing. This is gorgeous Liz, I love the cool colours and you've coloured Milly beautifully. I love all the detail on this one. This is such a fantastic image. I love the colours you have used as well. great bow detail. This is beautiful Liz, a pretty card! Just gorgeous Liz, love that sweet image and those papers are fabulous too! I'm freezing. Bye the way, where is Evil Edna these days? Wow! Another stunning card Liz, love the fluff on the mouse!